Cod Liver Oil serves as a potent source of vitamin A and D complexes, both of which are necessary to the body in healing processes pertaining to skin conditions, eye and vision support, all tissues, bone health, joint stiffness, hair, nails, cardiovascular health, and the liver. Excellent for skin, vision, nerves, brain, wounds & more! Norwegian Cod Liver Oil, Natural Citrus Flavoring, Rosemary Extract, Ascorbic Palmitate, Ascorbic Acid, Soy Lecithin, Sunflower Lecithin, D-Alpha Tocopherol, and Vitamin D3. Inactive Ingredients: Gelatin, Glycerin, Water, Caramel Color and Natural Citrus Flavor. In addition to the unique properties, synergists and cofactors of this food, each serving provides the following nutrients contained within the above food-nutrient blend (not as isolates): Vitamins D, E, and A; Omega-3, Omega-6, and Omega-9 in the form of EPA, DHA, Linoleic Acid, and Oleic Acid. 1 soft gel daily, or as directed by a healthcare practitioner. 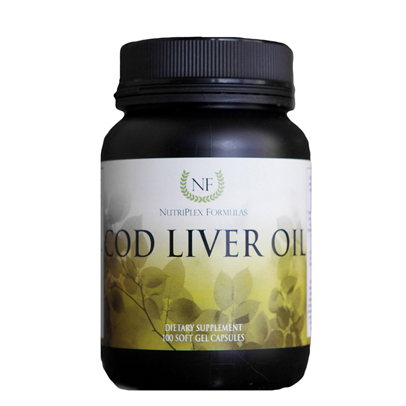 Cod Liver Oil is a centuries-old curative used in traditional healing. It provides vitamins A and D and essential fatty acid content that protect and build tissue linings throughout the body, with special emphasis on the musculoskeletal system, skin, and cardiovascular tissues. These vitamins are used in most biochemical processes needed for organs, nerves, and tissues to function optimally. IMPORTANT NOTICE: ©2015 NutriPlex Formulas, Inc. • Statements are made based on independent food science research and have not been evaluated by the FDA. Information contained herein are for educational purposes only and are not to be used for or in place of proper medical diagnosis and care under a qualified physician. Always check with your physician before using any product for contraindications and proper use.